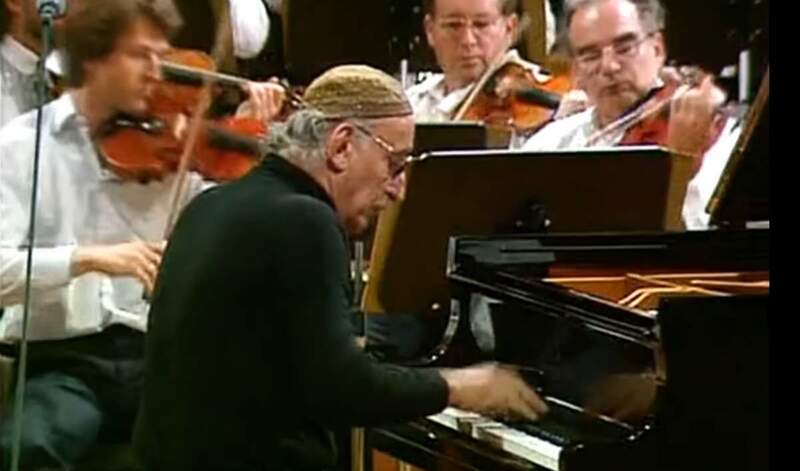 Austrian pianist and composer Friedrich Gulda performs Wolfgang Amadeus Mozart’s Piano Concerto No. 20 in D minor, K. 466. Gulda also conducts the Munich Philharmonic Orchestra. Mozart’s 20th piano concerto was written in 1785. The first performance took place at the Mehlgrube Casino in Vienna on February 11, 1785, with the composer as the soloist (Mozart was widely considered as the greatest pianist of his time). Allegro (in D minor) The first movement starts off the concerto in the dark tonic key of D minor with the strings restlessly but quietly building up to a full forte. The theme is quickly taken up by the piano soloist and developed throughout the long movement. A slightly brighter mood exists in the second theme, but it never becomes jubilant. The timpani further heighten the tension in the coda before the cadenza. The movement ends on a quiet note. Romanza (in B-flat major) The second movement is a strophic romanza whose customary tranquility at first seems reinforced by its B-flat major key and the support that piano and orchestra provide each other by passing around and even completing each other’s phrases, but then is torn by a strong central agitated section in g-minor. Allegro assai (in D minor, ending in D major) The final movement, a rondo, begins with the solo piano rippling upward in the home key before the full orchestra replies with a furious section. (This piano “rippling” is known as the Mannheim Rocket and is a string of eighth notes (d-f-a-d-f) followed by a quarter note (a). A second melody is touched upon by the piano where the mood is still dark but strangely restless. A contrasting cheerful melody in F major ushers in not soon after, introduced by the orchestra before the solo piano rounds off the lively theme. A series of sharp piano chords snaps the bright melody and then begin passages in D minor on solo piano again, taken up by full orchestra. Several modulations of the second theme (in A minor and G minor) follow. Thereafter follows the same format as above, with a momentary pause for introducing the customary cadenza. After the cadenza, the mood clears considerably and the bright happy melody is taken up this time by the winds. The solo piano repeats the theme before a full orchestral passage develops the passage, thereby rounding up the concerto with a jubilant D major finish. 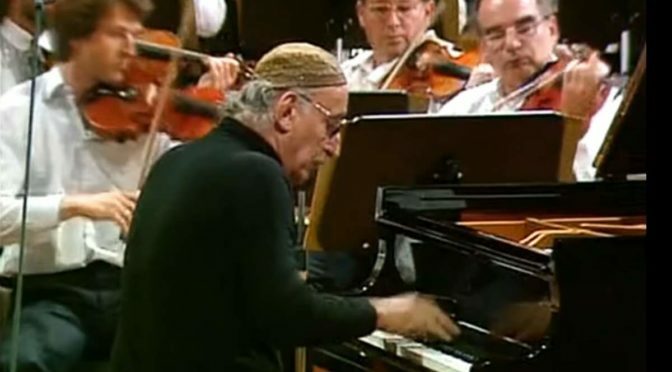 Friedrich Gulda (16 May 1930 – 27 January 2000) was an Austrian pianist and composer who worked in both the classical and jazz fields. Although most famous for his Mozart and Beethoven interpretations, Gulda also performed the music of J. S. Bach (often on clavichord), Schubert, Chopin, Schumann, Debussy and Ravel. His recordings of Bach’s Well Tempered Clavier are well regarded by collectors. Apart from the Well Tempered Clavier, Gulda performed very few other pieces by Bach and recorded even fewer. Gulda’s later reliance on co-operating with companies whose recording techniques were primitive in comparison to those espoused by more sophisticated rivals stood him in very poor stead with regard to posterity. The rescued Mozart sonata tapes issued on DG are unbelievably bad in terms of recorded technical quality; likewise the Debussy Preludes and Bach recordings of the late 60s and early 70s. From the 1950s on Gulda cultivated a professional interest in jazz, and in Free improvisation or open music improvisations, writing songs (he also recorded as a vocalist under the pseudonym “Albert Golowin” – and using trick photography the very mischievous Gulda even combined film footages and still images of himself – wearing a wig and a fake beard as a disguise – as “Friedrich Gulda and Albert Golowin performing together”, to his delight fooling the music critics for years [“It was great fun while it lasted!” – exclaimed Gulda], until finally someone figured out that Friedrich Gulda and Albert Golowin were the same person…), and instrumental pieces, and at times combining jazz, free music, and classical music in his concerts. Gulda died on January 27, 2000, the same date when his favorite composer Mozart was born (January 27, 1756).